You have to provide your Steemit username and verify it through a link that the bot will send to you via chat. You should pay for the attestation. This is worth 49,000 bytes. Since you are a new user, you have 0 bytes to spare. 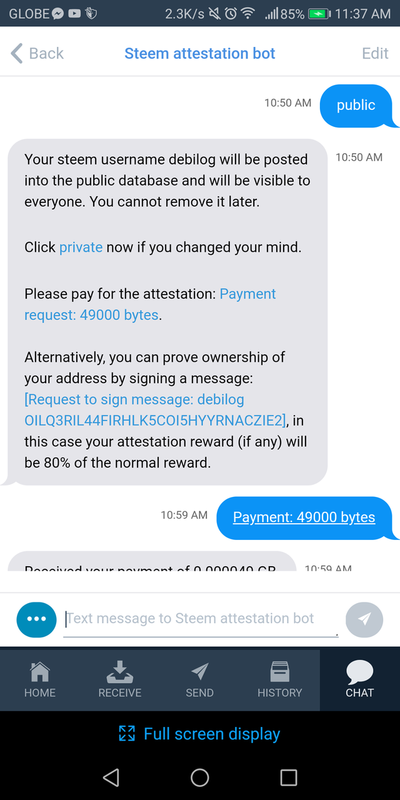 I, together with the users who have successfully attested, can help you by sending you some bytes for your payment. You have to send us your wallet address. To do this, go to the receive tab on your byteball wallet and copy your wallet address. Paste it on the comment section so we could see it! To know more about Byteball, you need to read this post by @punqtured. If you are skeptical, worry not. I already tried it and it's legit! @debilog you were flagged by a worthless gang of trolls, so, I gave you an upvote to counteract it! Enjoy! !